The Punchers took a chance when they hired the hometown guy in 2011, and it has paid off for everyone involved. In one of the final conversations Kade Burns had with his father before he passed away in August of 2009, Melvin Burns – a legendary coach in Mason – told his son he was proud of how hard his Thorndale team played despite walking away on the losing end of the 2009 season opener. Melvin, who was 71 at the time, wasn’t sure he was going to be able to make the 200-plus mile trip from Mason to Normangee to see Kade take the field as a head coach for the first time. But Melvin decided late Thursday night he didn’t want to miss the milestone in his son’s career and was there to greet Kade just outside the stadium fence before the game. Kade and the Bulldogs lost 20-7, but Melvin’s message afterward has played an important role in the way Kade Burns’ teams have played over the last decade. Melvin Burns passed away later that night just hours after getting one last opportunity to see his son on the sidelines. “I share that story with the kids,” Kade Burns said. “I want our athletes to know where I'm coming from and how important it is for us to play hard. You know, it's not always about the wins and losses. Hopefully you get the wins, but I think our job as coaches is to get these guys prepared for what's going to happen to them after high school. A great work ethic and being a great teammate are important. Melvin got out of coaching football when Kade was in junior high but still coached his son in golf throughout his high school career. Kade graduated from Mason in 1995 and went on to attend Abilene Christian University, where he graduated with a bachelor’s degree in exercise science and health in 2000. Kade knew from a young age that he wanted to get into coaching and never wavered on that goal while attending high school and college. He accepted his first coaching job as a middle school assistant at Abilene Wylie almost immediately after graduation. Sandifer said Burns was never afraid to spend the time learning and growing as a young coach and it didn’t take long for him to move up to the high school level. 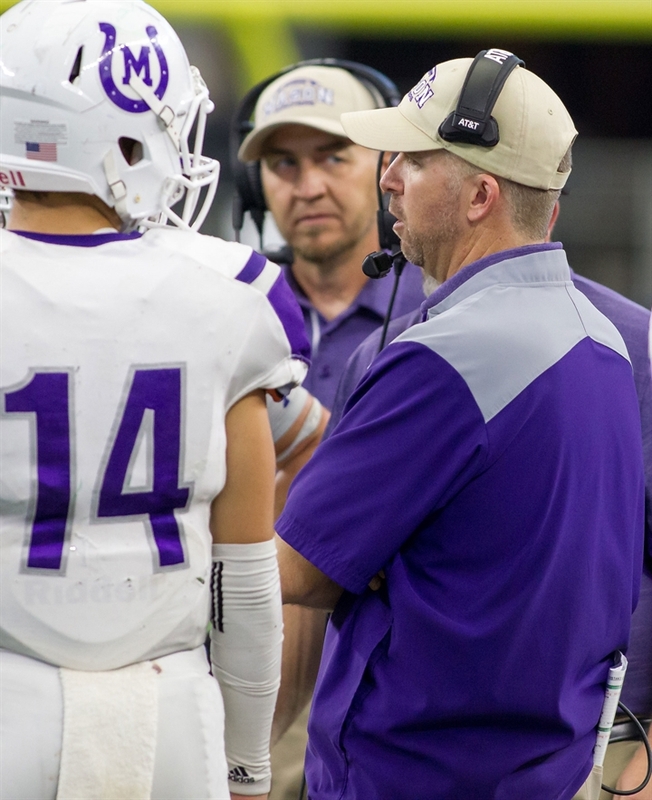 After spending four years at Wylie, Burns felt like he was ready for the next challenge in his career and accepted a coaching position at Ballinger under coach Mickey Owens. Owens, who played for Melvin Burns at Reagan County in 1978-79, was familiar with Kade and his family. The transition was seamless, and Kade became a key member of Owens’ staff. After about 11 months, Owens left Ballinger to take the head coaching job at Monahans and ensured Burns was one of the coaches to make the move with him. But with his wife Julie seven months pregnant with their oldest daughter Avery at the time, the move took some convincing. “It was a complete roll of the dice in our opinion,” Kade Burns said. “It was a move to an area of the state that we had never been to. But everybody in that town supported the school tremendously and we were successful early, so that was really helpful for us. Owens’ staff at Monahans featured several assistant coaches with previous head coaching experience, which provided Burns ample opportunity to learn from well-seasoned leaders on both sides of the ball. It was under Owens that Burns developed the physical style of play his teams later became known for. Burns and his wife fell in love with Monahans because of the people in the community, and the success of the Loboes made Burns a viable head coaching candidate after four years with the program. With all the knowledge he gained under Owens and his staff, Burns was prepared to take over his own program in 2009 and was named the head coach at Thorndale in the offseason. “He had a lot of good head coaching qualities that were evident right from the beginning,” Owens said. “I just knew one day he was going to be a real good head coach. He studies the game, the kids really like him and they play hard for him. Burns had immediate success at Thorndale, winning a district championship in his first season before falling to eventual state champion Goldthwaite in the first round of the playoffs. The Bulldogs posted a 7-3 record in 2010 despite moving up to Class 2A by just a handful of students, giving Burns a 15-6 record through his first two seasons as a head coach. “I had some help from some great administrators,” Burns said. “That was important. I got to learn how to manage everything. You kind of have a blueprint of how you want things done and how it needs to be organized, but sometimes you have to be flexible to fit the needs of the kids. I think that’s something that’s critical for younger coaches to learn. Burns originally had no plans to leave the Bulldogs after the 2010 season. Despite missing the playoffs, Thorndale still managed to win seven games in one of the state’s toughest districts alongside Lexington, Rogers and Franklin. But with summer right around the corner, the head coaching job at Mason unexpectedly opened in late May when Russell Joy abruptly resigned. The opportunity was an intriguing one for Burns. He applied for the job at his alma mater and was officially announced as the Punchers’ head coach on June 20, 2011. Burns was under a lot of pressure to be successful for more than one reason after returning to his hometown. His father Melvin was the winningest coach in program history after posting a 101-31-1 record from 1971-1977 and 1984-1988, and the Punchers were coming off a 12-2 season that came to an end in the state quarterfinals. Mason returned plenty of talent and entered the 2011 season as one of the top contenders for a 1A state title. Fortunately, Burns lived up to the hype – and then some. The Punchers were hardly tested in the first 11 games of the season, winning their contests by an average of more than 45 points per game. In the second round of the playoffs, Mason knocked off No. 1 Ganado 7-0 in an instant classic that helped propel the team on a run all the way to the state championship. 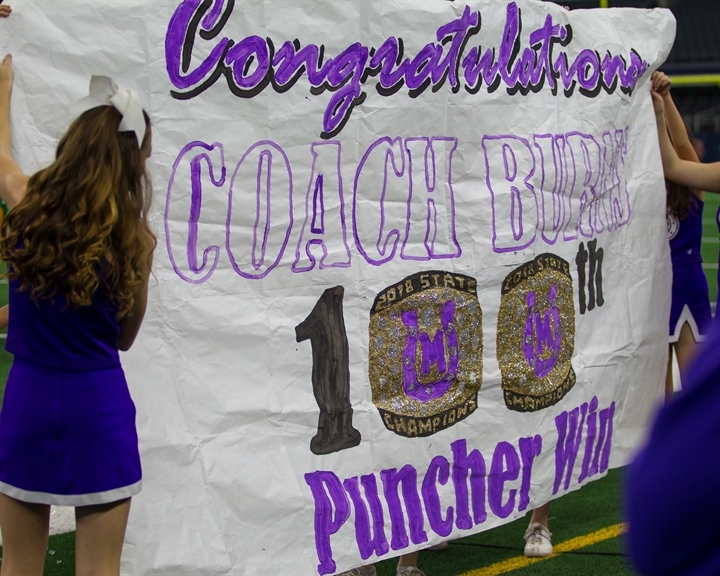 Burns led the Punchers past Stamford 62-40 at Cowboys Stadium, securing the storied program’s first-ever state title. “The stress and the pressure to be really, really good was very, very high,” Burns said. “But it was something that my wife and I wanted to be a part of. We had never won the state championship in the history of the city and in our first year we were able to do it. But the credit goes to the kids. Of course, Mason’s success didn’t stop after the first state championship under Burns. The Punchers went a combined 69-9 from 2012 to 2017 and advanced to the state title again in 2014. Mason fell short to Canadian in 2014 before again returning to the game’s largest stage this past season. The Punchers’ journey to the 2018 state championship was in many ways a reflection of the program’s selfless attitude. Playing with the motto, “We’ve got your six”, which emphasized each teammate having each other’s back, Mason overcame the targeting ejection of star quarterback Otto Wofford to knock off arch-rival Refugio in the state quarterfinals. That win came just a week after the Punchers overcame an injury to Wofford to knock off Wallis Brazos, as backup quarterback Whitt Bierschwale stepped in to lead Mason to a victory. The Punchers went on to dominate New Deal 44-6, securing a perfect 16-0 season and the Class 2A Division I state title. “We have a lot of guys in our athletic program, boys and girls, that compete,” Burns said. “They love to compete, and they love to play hard. They know that's what we do. They know we're going to play hard, we're going to be physical and we're going to try to be tougher than the opponent. Mason’s competitiveness and success isn’t limited to the football field under Burns. The Punchers won the UIL’s Lone Star Cup in 2018 for the first time in school history, an achievement that honors the best overall athletic and academic programs in Texas. The girls basketball team advanced to the state semifinals and the baseball team played in the regional finals, while the girls cross country team, boys and girls golf teams and tennis teams also had tremendous seasons to contribute to the Lone Star Cup victory. As of Jan. 25, the Punchers ranked No. 7 in the Lone Star Cup 2A standings this year. “There’s a lot of pride in our town, not just in football but in other sports that we have,” Burns said. “I've seen just improvement in the overall sense of community that we have here, and I think the success that we’ve had has helped to keep things kind of being really contagious to the other sports. 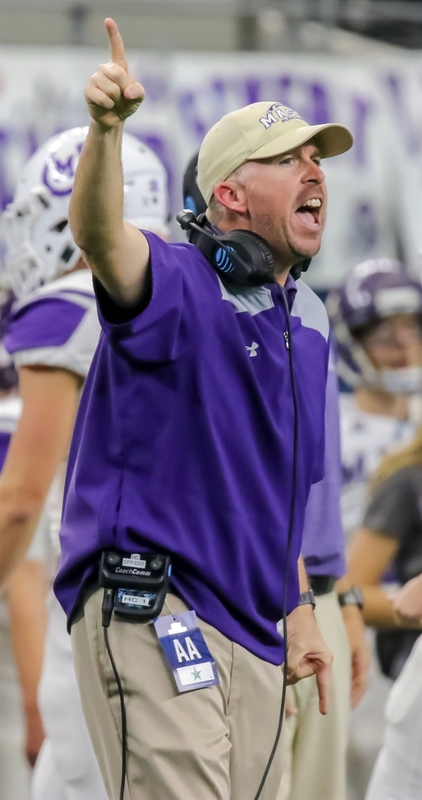 Burns credits a quality coaching staff surrounding him for the year-in-year-out success the Punchers have had throughout his tenure, and said the expectations continue to rise as the younger classes try to replicate what those before them have accomplished. With the combination of competitiveness, tradition and the same work ethic that caught Melvin Burns’ attention in Kade’s first game as a head coach, Mason is destined to continue to succeed at the highest level. And Kade, who is now 100-9 as a head coach at Mason, needs just one win in 2019 to tie his father’s all-time school record. “He got to see one game live, you know, in the stands, but he's gotten to see them all with the best view that you can possibly have for the rest of them,” Kade Burns said. “Somebody said when I first got here that they’re going to compare me to my dad, and I said that’s fine because he’s number one in my book. If I’m even remotely close to being able to be compared to him, that’s a success.